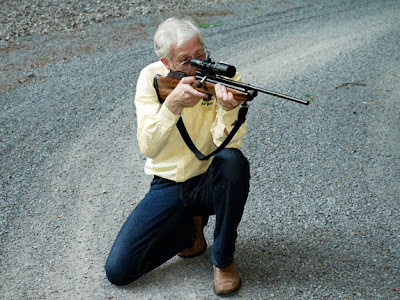 Archer on Airguns: So What Do You Do When The Gas Runs Low in Your QB78? So What Do You Do When The Gas Runs Low in Your QB78? Over the years, many people have asked this question, or something like it, so I hope this post will help those who are new to the QB78 family of air rifles and anyone finding a Crosman 160 and wanting to shoot that fine old air rifle. Both the QB78 and Crosman 160 air rifles are powered by two 12 "Powerlets", each containing 12 grams of CO2. After 50 shots, or so, the liquid CO2 in the "Powerlets" is exhausted and only gas remains in the gun. If more shots are fired, the gas is used and the pressure in the main tube falls with each shot. Thus, the point of impact of the pellets falls. Eventually, you need to "mortar" the pellets over onto the target. If this is continued, eventually a pellet will jam in the barrel as the remaining gas pressure will be insufficient to shoot it out of the muzzle. I normally stop shooting my QB78 after about 55 shots. "So, what then?" people ask. "The gun's not shooting well any more, but I can't remove the Tube Cap - it's still locked tight and I can't insert new Powerlets". Well, it's easy. Simply "dry fire" the gun (operate the trigger and bolt without shooting pellets) until the remaining gas is exhausted. It will take about 20 cycles or so to do this. You will hear the bang become softer and softer until all the gas is exhausted. Now you will also be able to unscrew the Tube Cap from your QB78 or Crosman 160. That's it! If the Tube Cap is still too tight to be removed, there's still gas in the gun. Dry fire it until it's all gone. How far should we screw the tube cap in? I think I may have done it too far because after clearing out the gas. The cap was easy to remove but once it was loose the thing just popped and all the powerlet's shot out like mortar fire. The pressure was like opening a champagne bottle. Did I not dry fire it enough? The gun (or so it seemed) did not produce any sounds anymore except fro the trigger click and the action. You did nothing wrong, but, in future, dry fire a few more times and this will relieve the last of the pressure. Some QB78 family air rifles with the long tube cap have been manufactured without a vent hole in the main tube in the screw thread area - this means they are more liable to "pop" the tube cap off - as you have found. I pointed this out to the factory during our visit last year and they promised to re-instate the vent hole. But it will take some time until all new guns are so fitted. I bought a TH78D in the UK recently (June 2010) and although it does have a vent hole in the main tube, the hole seems to be in the wrong place - the cap comes off the screw thread before the seal passes the vent hole, so it has no effect. I suspect it would have worked with the old vent cap which I believe was shorter. Do you think it would be OK to simply drill another small hole in the correct place? btw your website is excellent and the information you've made available is top notch, long may you continue! Personally, I'd probably leave it alone and not drill a new hole as making an error here would require a complete new main tube. But I just pulled a couple of guns out of stock to check (at random). They both have vent holes 3mm back from the front of the main tube. Is this what you have with your gun?